A new vice president for enrollment management will join The University of Toledo next month to advance efforts to increase student enrollment and retention. Jim Anderson, associate vice president for enrollment services for Boise State University, will start Monday, Jan. 7. “Jim’s comprehensive approach to enrollment management and his commitment to collaborating with units across an institution to develop the type of partnerships you need for long-term successes will enhance our efforts to attract and retain more students at UT,” President Sharon L. Gaber said. In his role leading enrollment management, Anderson will be responsible for providing direction for continuous, university-wide strategic enrollment planning that focuses on recruiting, enrolling, retaining and graduating a talented and diverse student body. 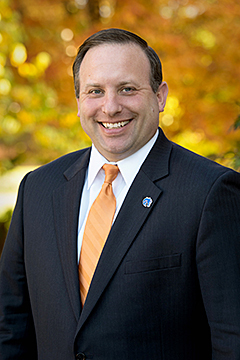 At Boise State, Anderson led three years of record enrollment across the entire institution, as well as in new freshman and transfer students. In addition, enrollment in the Honors College and the number of students living on campus also increased to capacity. He also created the first university-wide, long-term strategic enrollment plan and increased the use of analytical tools to drive data-informed decision making. Gaber thanked Stephanie Sanders, interim vice president for enrollment management, for her service to UT and assistance with the leadership transition. Sanders had announced earlier this year her plans to complete her tenure at UT and return to her home in Columbus at the conclusion of her contract. Her last day at UT will be Jan. 18. In addition to his experience at Boise State, where he had served since 2013, Anderson was director of enrollment planning at Texas Tech University, where he also served as associate director of financial aid and manager of its Teaching, Learning and Technology Center. Prior to joining higher education, Anderson was a teacher and managed a team in the development of curriculum and student support for Lubbock Independent School District in Lubbock, Texas. Since 2011, he has been a strategic enrollment planning and recruitment consultant for Ruffalo Noel Levitz working with more than 10 different campuses across the United States and in Canada. Anderson has a master’s degree in higher education administration and a bachelor’s degree in psychology from Texas Tech University. He is moving to Toledo with his wife, Sarah, and sons, Jay, 15, and Sam, 11. This entry was posted on Monday, December 3rd, 2018 at 11:00 am and is filed under News, UToday .